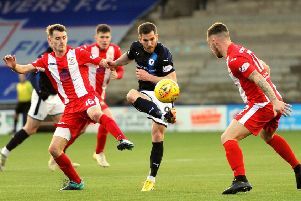 Raith Rovers striker Kevin Nisbet says missed chances cost Raith Rovers three crucial points against Forfar on Saturday. The club’s top scorer was left frustrated as the side passed up numerous opportunities to get the win at Station Park, but failed to capitalise and ended up on the losing side by two goals to one. Nisbet, who scored an early second half equaliser, said Rovers only have themselves to blame for losing the match. “I thought we started the game well,” he said after the final whistle. “We had a lot of chances but we just didn’t take them. “Then they get a chance and score which probably was against the run of play. “We got to half time and came back out and knew what we had to do. “I thought we started quite well and got back on level terms but then we gave away a goal which was so cheap. Whilst Rovers were profligate in front of goal, the same charge could be made against the hosts who had chances to extend their lead as both sides tried to take the lead when tied at 1-1. “That’s always going to happen when you’re pushing for an equaliser,” Nisbet said. “You leave yourself exposed at the back. The latter half of the league season has seen Rovers slip into an unwelcome pattern of slipping out of games in the second half. 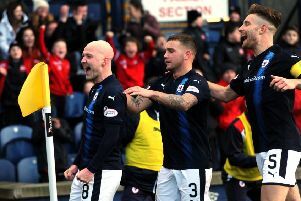 Manager John McGlynn has raised his own concerns about the problem and Nisbet concurs. “I can’t put my finger on it,” he said. “Like today, we started the game well, don’t take chances, the other team scores, we get back on level terms and then give away a cheap goal. “We’ll get in on Monday and have a look at it but we need to learn as players how to manage a game. “When we’re on top we need to take our chances. “We had about eight or nine today that should have put the game to bed. Nisbet and his team mates will now turn their attention to Saturday’s match at home to Dumbarton, who they drew with away back in February. “We’ll get in on Monday, get to work and get ready for that one,” he said.